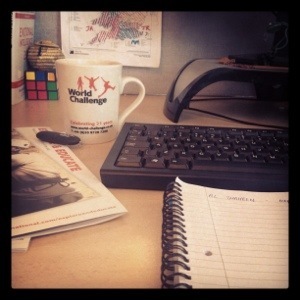 I am working at World Challenge HQ in High Wycombe over the next week so I will be writing a daily blog on here and on a seperate blog: http://worldchallengeworkexp.wordpress.com/ of what I have got up to in the office! I have been given a project to focus on, creating an e-newsletter for the organisation including stories/articles that the staff may be interested to read about. Every desk should have a rubik’s cube. It sharpens the mind and enables the thought process.